Guitar players navigate the fretboard in a few ways. First, they know the location of some key notes. For example, they often know the notes along the 6th and 5th strings well and use them to track chord shapes and scale patterns. Second, they identify notes on other strings by tracing them to the 6th and 5th strings with simple octave shapes. Remember when you had to match shapes in kindergarten? Now you can put that skill to good use. With the way that guitar strings and frets run perpendicular to each other and the way that they’re all numbered, the fretboard is like a grid. Instead of concentrating on the pitches and note names of the scales and chords you play, focus on how they fit into the grid. Everything you play on your guitar makes a shape or pattern. You get to know important relationships in music by arranging and connecting these shapes and patterns. 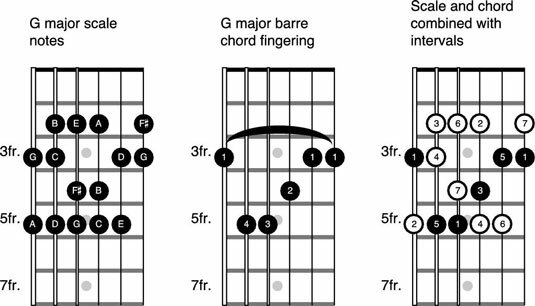 This grid-like arrangement is what separates the guitar from other instruments such as the piano and is why you don’t need to know how to read standard musical notation to develop a good working knowledge of guitar theory. Instead, you focus on the fretboard by using guitar tablature and neck diagrams. Neck diagrams are a great way to map out chord shapes and scale patterns. They allow you to see a bird’s-eye view of the guitar neck. The first diagram shows a sample G major scale pattern with the letters representing the notes. The second diagram shows a G major barre chord shape with the numbers representing fingerings. The third diagram shows a combination of both, with all the circles representing the scale pattern and the black dots specifically outlining the barre chord. Also, in this example the numbers represent neither notes nor fingerings but rather intervals. The numbers to the left of each diagram indicate fret numbers: 3fr. is short for 3rd fret, 5fr. is short for 5th fret, and 7fr. is short for 7th fret. Here, you’re looking at the face of the fretboard longways and upside down. The top line represents the 1st string, and the bottom line represents the 6th string. This is how you see the guitar neck when you hold a guitar to play it and lean over to view the fretboard in your hands. Notice that the fret numbers appear below the horizontal diagrams. As you see, a lot of information can be displayed in fretboard diagrams from scales to chords, notes to intervals, fingerings to shapes. Diagrams can be displayed vertically or horizontally. Reading music is a skill that requires a lot of study and practice; not to mention, standard music notation only indicates pitches. Because you can play most pitches in several different positions on the neck, you want to know exactly where to place your fingers for certain pitches. That’s where guitar tabs come in handy. Guitar tablature, or tab for short, is a number system that indicates exactly where to place your fingers on the fretboard. If you can count the strings and frets on your guitar, then you can instantly read tab. Tab is especially handy for writing out examples that you want to play in series, like a scale pattern or a set of chord changes. A neck diagram is used to illustrate what a scale looks like as a pattern and tab to show you how to ascend and descend through the notes of the scale in the proper order. Here are three chords written in standard musical notation. If you know how to read music, then you can easily find these pitches in the first position on the guitar. These chords aren’t all played in the 1st position. These chords are all based on the very same shape moved up two frets at a time. 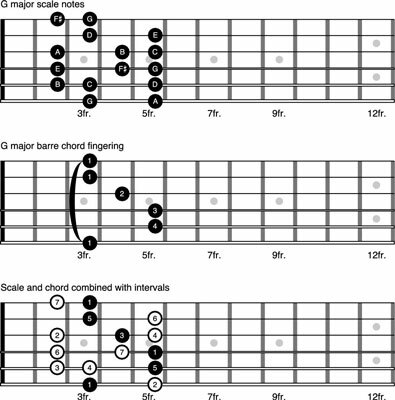 Here are the same chords again but this time with a more complex rhythm. In this case, it’s useful to have both forms of notation. Most guitar players look at the tab to finger and fret the notes and look at the music to count the rhythms. This is an example of slash notation, which is used when you need to play chord changes in time but not in any specific position or voicing. Usually slash notation includes only very basic rhythm marks, allowing you to fill the bar any way you see fit (called comping). With this type of notation, chord symbols appear above the staff. Some forms of slash notation don’t include note stems, only slashes, hence the name. This is an example of rhythmic notation, a method that specifies an exact rhythm in which to play or comp the indicated chords.